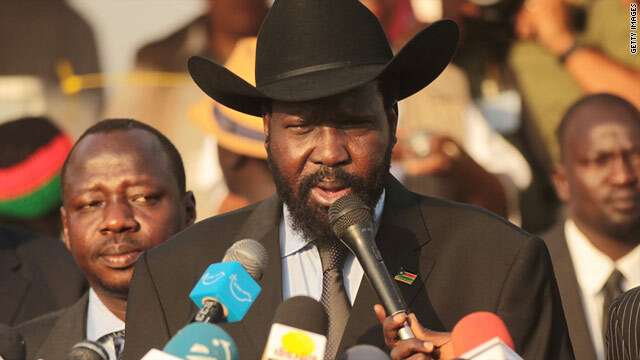 Stetson-wearing statesman Salva Kiir Mayardit will be president of South Sudan, the world's newest country. (CNN) -- South Sudan became the world's newest country Saturday, closing one chapter of the region's long struggle to cede from its northern neighbor. But though a heavy price has been paid for independence -- Sudan's north and south fought one of Africa's longest and bloodiest civil wars -- declaring statehood isn't as simple as hoisting a flag. There are certainly no blueprints for gaining independence and, experts say, South Sudan's secession boldly goes where no other new nation has gone before. Possibility of war in the Sudan? Not only this, but it is attempting to organize eveything from Juba, a capital city that just a few years ago was a dirt-track town largely cut off from the outside world, across a region with little infrastructure that is still reeling from conflict. So what does a territory have to do to achieve statehood -- and does South Sudan qualify? Any group or individual can declare their own nation, but without recognition from other states, this can be a futile gesture. Even with international assent, there can be problems. Says Louise Arimatsu, an international law expert at London's Chatham House, South Sudan is unlikely to meet resistance since its so-called parent state -- Sudan -- has agreed to the secession. This was not the case when Serbia refused to accept Kosovo's declared independence in 2008, resulting in delays bringing Kosovo into the United Nations fold. South Sudanese officials say they are on track for recognition by the U.N., the World Bank, the International Monetary Fund and other key bodies. No country can function effectively without a government. South Sudan has an advantage in that it inherits the basic entity that ruled Southern Sudan, including the leadership of its Stetson-wearing President Salva Kiir Mayardit. Elections are promised, but no date has been finalized. All nations must lay down the criteria for citizenship. For South Sudan, this could be a major stumbling block to nationhood since major issues still need to be resolved, says Arimatsu. With many southerners living in northern Sudan and northerners living south of the new border -- some displaced by war -- the United Nations High Commissioner for Refugees has expressed fears that "significant numbers" will be rendered stateless. "This is the big issue that needs to be sorted out," says Arimatsu. The south says it will recognize dual north-south citizenship and has urged the north to reciprocate. A constitution is by no means mandatory, but almost all countries find it a useful way to formalize rules of government. Southern Sudan has been kicking around such a document since a peace deal with the north ended fighting in 2005 but, even with independence looming, it has yet to agree on a final version. Paulos Tesfagiorgis, a constitutional adviser with the International Institute for Democracy and Electoral Assistance, says Southern Sudan has an interim constitution, but has yet to produce a document its people can unite behind -- and without it, South Sudan will struggle to assert its independence within its own borders. "It's extremely important; it's the document that's going to frame politics, the economy and other policy," he said. Not as simple as it sounds. Prior to independence, the territory that forms the new country was referred to as Southern Sudan. According to Southern Sudan's information minister, more than a dozen names have been suggested for the new country, and the new name Republic of Southern Sudan may only be temporary. "Should the people of South Sudan in the future want a new name, they will have that chance," he told the New York Times. Other suggested names have included Azania, Nile Republic, Kush Republic and Juwama. These aren't a requirement of nationhood but no country is now without one -- and as a talisman to rally patriotism, nothing quite beats a fluttering flag. Some standards are born of convenience: Indonesia's red and white flag was reputedly created when independence fighters tore the blue strip from the tricolor of their Dutch colonists. Others, such as America's stars and stripes, evolve along with the growth of the nation. Unsurprisingly, since a flag-raising ceremony is scheduled for Saturday, South Sudan has already designed its pennant: a black, red and green tricolor banded with white stripes and featuring a yellow star on a blue triangle. Not all new countries issue their own currency. East Timor opted for the U.S. dollar, a choice that some created hardship for some of its impoverished citizens. Thanks to oil resources, South Sudan has the economic clout to mint its own cash -- the South Sudan Pound -- but in doing so it has further undermined the stability of the Sudan Pound issued by its northern neighbor. Even before of the south's independence, there were fears that the northern pound would devalue as the north loses oil assets. This could create a panic as people try to offload their northern pounds, doing little to help uneasy relations with the parent country. It might seem a trivial matter, but a country needs a rousing tune, if only to have something to sing if they win international sporting events. But getting it right can be tricky. Peru has debated replacing the first verse of its anthem, sung since 1821, after criticism it was too gloomy. Southern Sudan held a competition to pick its winning tune. The winner, beating 42 entries, features lyrics that exalt "martyrs whose blood cemented our national foundations," set to a suitably anthemic arrangement of drums and parping horns.